Jaina from Time Well Spent kindly nominated All Eyes on Screen for a 7×7 Link Award. The award is meant for me to showcase my favorite posts I’ve gotten to write for All Eyes on Screen. Along with the highlighted posts, I will also be nominating 7 other blogs for this award (and for those of you who enjoy reading blogs – I highly recommend these. Please take a few minutes to check them out!) Had it been someone else nominating me, Jaina and her site Time Well Spent easily would have made my awards list. If you don’t get anything else out of this post, please scroll down and check out the sites I listed. They’re each worth a few moments to check out! Rule 1: Tell everyone something that no one else knows about you. Rule 2: Link to one of the posts that I personally think best fits the following categories: Most Beautiful Piece, Most Helpful Piece, Most Popular Piece, Most Controversial Piece, Most Surprisingly Successful Piece, Most Underrated Piece, and Most Pride-Worthy Piece. Rule 3: Pass this award on to seven other bloggers. Part 1 – What do you not know about me? This is a tricky question in and of itself. Most of my blogger friends know movie info about me that no one else knows, while my personal friends/family know all that other stuff that my movie friends do not know. So I kind of feel like I’m in this lose-lose place. OK, enough babbling on my end. To keep this about movies, I’ll make this little unknown fact about me and my relationship to movies. Growing up, I went to all the popular Disney movies–Toy Story, Hercules, The Lion King, you name it. As I got a little older (think late elementary school age), my private school and church did not support attending movie theaters. Unfortunately, I was not allowed to attend movies for the remaining part of elementary, all of junior high, and high school. Many who grew up with me know all this. The little “secret” is that the first film I attended after close to a decade of not stepping into a theater was . . . *drum roll* . . . Sam Raimi’s Spider-Man 2. I had seen the first film on DVD and enjoyed it, and I was blown away by the theater experience all over again–at 16 years old. While I can’t relive all that time I lost, I make up as much of that time as I can, happily attending movies at theaters ever since Spider-Man 2. Personally, I have a hard time evaluating which “pieces” I would consider “Most Beautiful” or “Most Underrated.” I almost feel like I’m saying, “Hey, let me tell you why I’m awesome.” The truth is, I haven’t been blogging regularly on film for very long, so it’s difficult to find a post that fits each category well. But to the best of my ability, here are the posts I would choose for the categories stated above. This was the first post that came to my mind when I heard the word “beautiful” because the content I’m talking about is incredibly beautiful. All three films incorporate some certain beauty, Midnight in Paris really being the stand-out for me with it’s gorgeous French backdrop and locations. The reason I chose this particular post for “Most Helpful” is that posts by other people I’ve read regarding film festivals/special screenings have been helpful to me in learning about films I never would have heard of if/before they became mainstream. 2 Days in New York was made by a French filmmaker, so it’s likely that the States will hear little of it, most likely for a little while at least. The post is primarily about my experience going to Sundance’s screening in Chicago and the interviews with the cast/director. This post wins because it’s received the most comments of all posts I’ve ever put up. Originally, I was going to put this in the Most Surprisingly Successful Piece, but it really has been the most popular post I’ve had, at least in terms of comments. The title alone offers proof that it’s an entirely subjective post based off bias. Like every year when the Oscar nominations are announced, the blogosphere is filled with everyone’s thoughts and reactions. This post received the most “critical” comments, primarily thoughtful comments that wouldn’t be considered all around controversial. While I wouldn’t necessary call a post of mine “underrated” (because who’s doing the rating then? me? ), if I could pick one post that I’d like more people to read, it would be about The Artist. Why is this? Because I feel like the movie didn’t have a mainstream audience. Although it was met with much critical acclaim and chatter online, the average attender of this film was either older or a movie geek. I’m quite passionate (everyone gets dramatic about something these days, come on!) about The Artist and would have loved to have successfully convinced many of my friends to go see it. I thought I might have a difficult time coming up with a post that I had any pride in writing, but once I saw this title, I knew it fit the bill. While most people have written off Dr. Horrible as a nerd-type thing, I think it could be more universally liked if people gave it a chance. Although I don’t mind being considered part of the Dr. Horrible fanbase at all! Aside from that, this was my first ‘Recast Edition’ post. It was a lot of fun to write, and it took a lot of consideration and time to put together. 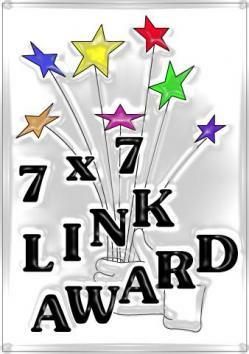 Now the really fun part comes – I get to nominate 7 other blogs to receive this 7 x 7 Link Award. Please check out these awesome blogs! Most of their writers put more time and love into them than I do into mine. Many of them have inspired me to write better, more meaningful, and interesting posts, and all of them have in some way contributed to All Eyes on Screen by either regularly reading or commenting and feeding the discussion on the site. Without question, Ruth over at FlixChatter has been an incredible inspiration for All Eyes on Screen. Every one of Ruth’s posts are filled with interesting information, videos, facts, reviews, tidbits–all on film–you name it. Her site introduced me to the movie community at Anomalous Material, where I’ve “met” the majority of my movie blogging friends. Her site is custom designed, and her writing style is easy to read. She’s constantly updating the site, responding to comments, and filling the site with thoughtful posts. Ryan over at The Matinee is another one of my favorite movie sites to visit regularly. I love the crisp, clean look of his site, and I enjoy listening to his podcasts from time to time. This guy is always open for film discussion, with something positive or interesting to add. His level of writing is incredibly professional, yet very conversational. Ryan is one of the few bloggers I think could make a living writing about film given the right platform. Check out his site, and spare a few minutes to listen to one of his podcasts. One of my coworkers, Josh, heads this photography site called Expressions. If you want to see creatively shot photos, this is the site to visit. Each photo is a story, bearing a fitting caption. I have bought three photos from Josh and know that my JLS photo collection is still incomplete. If you’re searching for inspiration or just want to check out some awesome photos, be sure to check out Expressions. Remember a little post called “Support an Independent Film”? Well, the filmmaker in that post, Melanie, also has this incredibly detailed and insightful blog called Grass Roots Movement. While personal posts/tidbits are added throughout, she holds a very firm view on a variety of topics, and she has this edgy writing style that immediately pulls in readers. She also posts about film on occasion. I promise that Grass Roots Movement will never bore you. Keith & the Movies is one of the movie sites I’ve recently become a regular reader of. If you’re looking for well-written, thoughtful film reviews, Keith & the Movies is the place to go. Each review contains outside information about the film that I never knew until I would read a post of his. They’re not too short, but the posts are also not too long that you get bored reading. Keith & the Movies is one of my favorite movie reviews sites to read. Pete from I Love That Film is perhaps one of the most loyal readers and supporters of All Eyes on Screen. And on top of all that, Pete heads his movie blog, I Love That Film, with a variety of posts on film on a regular basis. I love reading his opinions and jabs and quirky insight, and I have no doubt that the rest of his readers feel similarly. From reading I Love That Film, you’ll learn that Pete is incredibly funny, down-to-earth, and always game for movie discussion. This awards list would NOT be complete without Cinema Romantico, headed by a very talented writer named Nick. He’s the most passionate movie writer I’ve met on the blogosphere, and that’s saying something. He writes the most in-depth posts I’ve read about film, and he holds all the potential in the world to be a famous movie critic someday if he desired. He has a heck of a lot of insight and knows exactly how to say what he wants. In my opinion, Cinema Romantico is a must-read blog for any movie geek out there. ← The Hunger Games . . . It’s Everywhere . . . Make It Stop! Woo hoo, looks like we’re doing this 7×7 award thing at the same time, Kris, we must be kindred spirits! 😀 Thank you ever so much for the kind words you said about me… I’m so blessed to have ‘met’ you on the blogosphere! LOVE your blog, I think you’ve got tons of beautiful posts, but I agree that I absolutely adore your ‘Backstage Spotlight’ post. I really appreciate that you take your time with your posts and most of them are original and personal. Keep up the wonderful work, certainly your award is ever so well-deserved! I noticed that! Haha, love it – most definitely 🙂 The feeling is definitely mutual, Ruth. It’s always especially cool when you meet another Christian who also happens to love film! Wow, I appreciate the compliments, Ruth! Thank you! It’s still a work in progress, but I’m OK with that. Yes indeed, we’re ‘kindred spirits’ in more ways than one Kristin 🙂 Say, are you planning a special post for Easter? I did last year and this time, since it’s happening around Gregory Peck’s birthday, I’m going to review one of his religious-themed film, David and Bathsheba. I highly recommend that for any time of the year, but especially at Easter. Hey! Such a late response to this comment–sorry!! I will definitely have to head on over to FlixChatter and check out that post. I don’t think I’ve seen enough religious films, aside from Passion of the Christ. I went to the Good Friday Easter program at my church today, and thought of you, Ruth. The Gerard Butler-sound-alike was singing (and he sounded wonderful!). Such a blessing. Hope you’re doing something enjoyable with your family this Easter! Congrats and thanks Kristin! I actually already did this a couple of days ago and nominated you! But thanks for the kind words, you make me and my blog sound pretty cool! You’ve also just introduced me to a couple of new blogs to check out! I can’t believe you weren’t able to go to the cinema for so long. Must have made Spiderman 2 an awesome awe-inspinring event! I’d go a bit crazy without films. Kepp up the good work, love this blog! How on earth did I not know you did? Crazy! Thank you so much, Pete – I will be sure to check it out soon!! I know, it was rough. Definitely happy that part of my life is now passed 🙂 Yes, Spider-Man 2 was quite something then! Luckily, I don’t have to go crazy anymore, haha. Thanks, Pete! The same to you!! WOW! Thanks Kristen. Can’t tell you how much I appreciate the kind words. I’m still trying to find out exactly what I want my blog site to be but I’ve felt you have helped me shape it so far. Love your blogs and reviews and I really appreciate it that you check mine out as well. You always leave such good insight. Keep up the great work. Can’t wait to see what you have next for us. Definitely! I understand that–still working out a few kinks over here too 🙂 Happy if I’ve ever been able to help in any way! I appreciate your back and forth as well. Glad to have you met you on the blogosphere, Keith! Jeez, Kristin, that is one of the nicest things anyone has ever written in conjunction with my name. From the bottom of my heart, thank you. That means a lot. And I, like Jaina, would nominate your site for this award in half-a-second too. You and I are the two Chicago bloggers in this community of, like, 7,200 Toronto bloggers! We have to stand strong! As for Dr. Horrible, I have seen it. And I love it. One of my friends forced me to watch it a couple years ago as I didn’t even know it existed. And while I love Nathan Fillion in it – and in general I think Fillion should soooooooooo be a major star – that alternative of Jon Hamm intrigues me. I was thinking the same thing – you’re the only other Chicago movie blogger in this community that I’m aware of! Absolutely!! Yay, that warms my heart to hear that! Glad you were able to swing by that post, Nick. I LOVE Nathan Fillion (and especially in Dr. Horrible), but I always find it fun to wonder what it would be like if other people were in the roles. Thanks for taking the time to check that out. Thanks, Castor! Yeah, that was definitely a difficult time. Just happy to say that it’s passed and I can see all the movies I desire now!!!! I have so many balls in the air with the site right now, that I’m not sure when I can sit down and properly pass along this meme to another much-deserving seven…but I will try. In the meantime, thankyouthankyouthankyou for the kind and encouraging words. I know you’re somewhat new to my readership but it’s been a long road to get things to where they are for me, and specifically a very busy year launching the site as you now know it. Where it goes from here I’m not sure, but with dedicated readers such as yourself I won’t stop pushing things forward anytime soon. So again – thanks! It would appear as though the release date I’m reading wiould confirm that your Matineecast episode will indeed be DARK SHADOWS…so get ready for that. And in other news, guess who’s likely venturing down to Chicago in July. Ryan, I’d love to see who you’d hand it over to, but I can understand having so much going on that it’s difficult. I’m still within a smaller group of movie bloggers, that I had a little easier of a time. It can be difficult when there are SO many fantastic sites and bloggers out there! Most definitely. I very much enjoy your site and podcasts. Keep up the fantastic work, Ryan! All right! Awesome – that makes me happy, being the Johnny Depp fan that I am. That movie looks hilarious to me. So excited for you! Have you been to Chicago before? I hope you thoroughly enjoy your time in the Windy City when you come! I gave 3 Guys Movie Blog an award and then I’m rewarded by having them recommend this blog to me. Nice turn around. Since I’m new here I’m going to have to look around. Wow, thanks for the compliment, and welcome to the site! Hope you enjoyed your look around. AEOS is still VERY much a work in progress, but I’m happy with how far it’s come in a relatively short period of time. Looking forward to checking out your site as well. Thanks! I loved your piece on re-casting Dr. Horrible! It was perhaps the most realistic recasting I’ve seen. From a fan’s POV but also with a good subjective eye. Wow, thanks, Jaina! I definitely appreciate that! Thanks – the feeling is definitely mutual!